How to tell amazing stories at your next presentation – Steal These Thoughts! Do you hear that? that’s the sweet sound of cheers from your audience and that feeling? that’s the feeling of success in owning that stage, telling your story and delivering the best presentation of your life. But how do we get there? what do we do to get this feeling? Let me share with you some tips that have helped me go from a timid speaker, that would melt having to say a few words to a small group of people to someone who regularly gives talks to crowds of 500+ every few weeks. This was by no means a quick process, it has been a 5 year journey but the key to my success in this field has been consistency. I’ve consistently put myself in those environments I consider uncomfortable and now I find great comfort and excitement within them. Here are some tips that have helped me and might help you too. It’s so important to learn to take a breath, pause and compose yourself when speaking, it’s also a great tool to save yourself from the attack of the erms!! How many times do you hear people say erm during a presentation? generally it’s a lot and in my experience it’s mostly because people have lost their train of thought or trying to think about what to say next. Every time you want to say erm replace that with a breath. Survey the field of faces, connect with your front row – don’t follow the foolhardily advice of staring at the back of the room, are you a robot? do you want people to think you’re having a stroke? You know your stuff, your here on merit, this is your subject expertise – talk to the crowd like you would a close friend, crack a joke, raise a smile, drop knowledge bombs but most importantly be authentic, be real, be you. Show your passion, throw those moves, loosen up – you’re not a robot so don’t act like one. Bring your energy and enthusiasm to the front, people will connect with you more when you show you care, because if you care then they start to feel like maybe they should too. Nobody wants to come and see a 50 slide breakdown and I mean nobody. Don’t get me wrong PowerPoint is cool, but you have so many more ways to tell your story. Can you present with 1 slide, 2 slides, no slides or an image of a cat playing a piano and still articulate your key points? if so then use it, select the best tool for the job and don’t put your audience to sleep with duplicates of slides with no meaning. Your slides should serve as an anchor, a place to demo any visuals that bring life to what you’re talking about, they are to support not act as the star of the show. Remember to never use your slides as some form of script! Slides with lots and long bullet points are a one way trip to disengagement. Nobody wants to spend 15 mins watching you read a bunch of lines off a screen, they want to be informed, educated and you know what? they could just have read the slide deck at their desk if your plan was that. This brings me oh so nicely to my next point. Don’t use your slide deck or take reams of paper up with you to read from. Now cue cards, pointers and small prompts built into your presentation or on paper are perfectly acceptable if you have complex information you need to unpack in a simple manner. But a full play by play script of exactly what you want to say is a big no no and the most unauthentic thing you can do, it also kills any real hope of a connection with your audience. Be authentically you – yes it sounds cheesy, yet you’ll never achieve comfort and confidence in public speaking if you pretend to be something you are not. Remember why you’re giving these talks? it’s because you have knowledge that people want, you’re the person who knows their stuff. You’ve been asked to speak at an event for a reason. You know the content inside and out, find confidence in the fact that you have the knowledge and all the tools that you need within you. These are the tips that I can share from my personal experiences, but they are by no means a complete list and I’m sure I will add more with each public speaking experience I have. Hopefully these can be of help to you, I’d love to hear your experiences and tips too – share these with me in the comments. If you like my writing and think “Hey, I’d like to hear more of what this guy has to say” then you’re in luck. You can subscribe to my weekly newsletter here. Every week I share a dose of my own writing and interesting content that has caught my eye, it’s free, no spam, unsubscribe whenever you want. 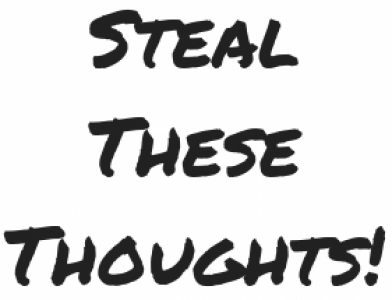 Enter your email address to follow this blog and receive the Steal These Thoughts! newsletter.